Food & Beverage Manufacturing is all about moving food from the farm through a manufacturing/distribution process to the fork at the dinner table. 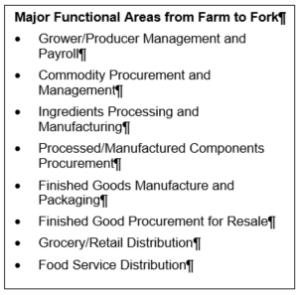 This article discusses the high level functional requirements needed to go from Farm to Fork and develops a model by which technology solutions can be compared. Today’s technology solutions focused at the F&B industry do not cover the entire span of functional requirements this industry faces. The reality is that some solutions are focused very tightly on one or two areas while some solutions have a broader, but still incomplete, reach. This article defines the different functional areas and the processes they encompass. A graphical representation of h ow the functional breadth of any one vendor’s technical solution can be portrayed and compared to other vendors is also described. The overall objective is to define evaluation criteria and propose a graphical model that allows easy, high level comparison of competing vendor solutions. We call this the “Slider Model” and see it as a complementary vendor/solution evaluation scheme to our Solution Assessment Profile (the “Spider Chart”) and the Functional Assessment Framework (the “Bulls Eye Chart”). Grower/Producer Management and Payroll: Grower/producer management functions are necessary for managing the unique relationships between the food manufacturer and contracted or captive commodity producers. An example of these functions is the producer payroll function associated with dairy operations. Not only is there a unique payment methodology which must consider payment estimates with subsequent reconciliations and Federal Dairy Board pricing, there are also specific governmental reporting requirements. None of these methods and reports are supported by the standard Procurement and AP functions of an ERP. Commodity Procurement and Management: Commodity procurement and management is different from normal procurement as it needs to be capable of not only purchasing commodity raw materials, it should also be able to deal with some aspects of commodity trading. For example, a coffee company not only purchases for its own manufacturing needs, it may also be speculating with coffee contracts that they know they will not use internally and will most likely resell. Ingredients Processing and Manufacturing: Ingredients manufacturing produces a product that is an ingredient to some other intermediate product of finished good. Just like any finished product, ingredients have all the product attribute concerns (e.g. heat, acidity, color, etc.) and need to deliver these attributes consistently. For ingredients, this drive to deliver consistency is complicated because of the derivation of these ingredients from biological sources that are anything but consistent in the key product attributes required. Managing production processes with this variability in raw materials to deliver consistency in finished goods is not easily achieved in a standard ERP solution. Processed/Manufactured Components Procurement: This is a traditional procurement model where standard items are purchased as raw materials or ingredients for finished goods production. Packaging materials would also be included in this area. Finished Goods Manufacture and Packaging: Unlike ingredients processing, this area is a traditional packaged goods manufacturing and packaging process. It is common in many ERP systems. Finished Goods Procurement for Resale: This functional area is the procurement and management of products purchased for resale. These purchases augment the product catalog of the enterprise beyond their normal manufacturing processes. Grocery/Retail Distribution: This is the sale and distribution of finished goods in consumer packaging formats, typically, through grocery, convenience, and other outlets. Food Service Distribution: Foods service distribution deals with all the same products typical of the grocery/retail distribution area but may also include different packaging, sales relationships and discounting, as well as special services demanded by restaurants, caterers, and institutional food preparation operations. 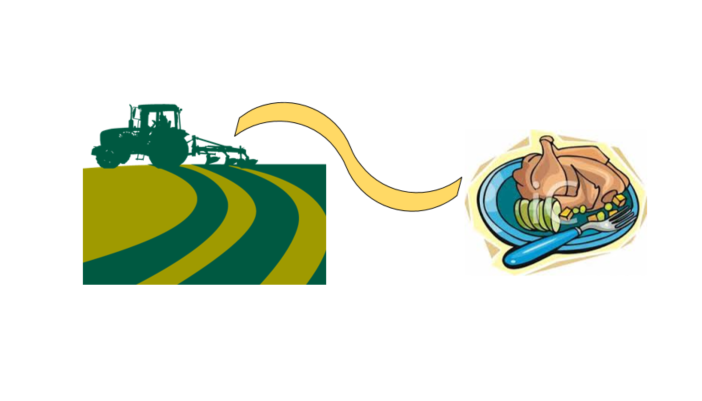 The F&B Slider model depicts these eight different functional areas as a spectrum leading from the farm to the fork as shown below. This model allows us to depict, at a high level, the functional penetration or support of any technology solution in any one functional area. Shown below is the representation of a solution that supports the movement of food products from the farm through manufacturing and distribution to the grocery store. The one area that it doesn’t support is food service distribution. This model only gives you a preliminary idea of what the solution will provide, it does not give you any idea as to the depth of functionality the solution offers in a specific area. Our Bullseye model describes this depth of functionality more completely. Neither of these models replace the need for a Request for Proposal along with structured demonstrations focused on your very specific requirements. Our methodology, as described in the Six steps to Success, details the steps we recommend when executing a software selection project. It is possible to get a high level comparison of multiple vendor solutions using the F&B Slider Model as shown below. In this comparison view, we see that the XYS Solution has similar functional breadth as our original vendor picture of ABC Solution but is missing the grower/producer management area. The 123 Solution is more suited to a distribution environment where kits or simple components are sold together along with final products that were procured for resale. The 560 Solution is the solution most focused on the classic food service distribution business that has limited specialty services. The Food and Beverage industry has many distinct and important solution requirements in multiple areas. When searching for a new technical solution, it is important to start that search with a list of vendor’s that are generally believed to offer solutions for the functional areas you are interested in. This “Slider Model” provides a visual way to represent the capabilities of any one vendor at a high level thus enabling you to compare multiple vendor’s capabilities and select an initial list of vendors to consider in your software selection efforts. In our paper on the Solution Provider Profile for Food & Beverage Manufacturing, we discuss how this Farm to Fork, the Solutions Requirements Model (the “Slider Model”) works together with the Solution Assessment Profile (the “Spider Chart”) and the Functional Assessment Framework (the “Bulls Eye Chart”) to assist you in finding the right initial vendors to include in your search for a new technology solution for your enterprise.